Unless you’re part of the inner circle of a band or someone who works at a gig venue then chances are that a soundcheck is simply something you’ve heard about but never been present at. Aside from being an opportunity for the musicians and mixing desk to get their levels set, the intimate ritual of the soundcheck provides a time for those final tweaks and adjustments that can shift the imminent gig into symbiotic harmony with its surroundings. As such, it’s mostly a time of privacy that even the most ardent of fans are excluded from, but one which filmmaker Robin Thomson has been bringing to light with his ‘from behind closed doors’ Strangely Ritual series of films. 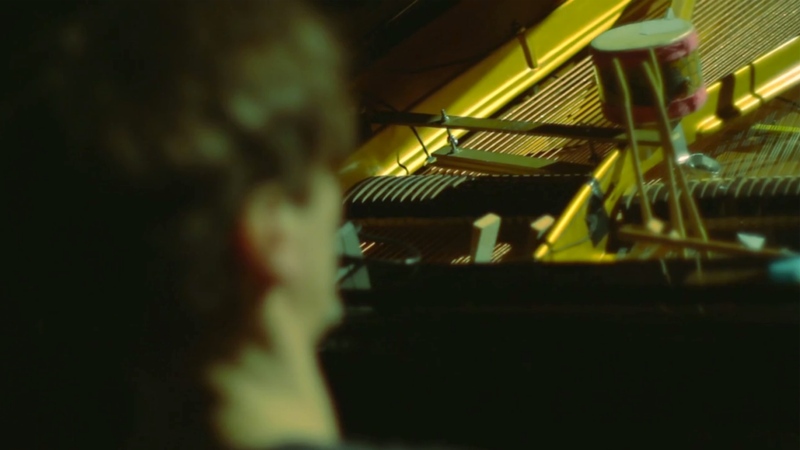 Today Robin takes DN behind the scenes of his documentation of pre-gig preparation, but first provides us with the exclusive first look at his latest episode, for German pianist/composer Hauschka which features Múm drummer Samuli Kosminen, just before their show at the Volksbühne Berlin last year. The initial concept came from witnessing (and taking part in) so many soundchecks, and feeling like it was always a kind of secret performance going on that others are not privy to. Many artist I’m sure are uncomfortable being watched as they are soundchecking, because it’s all very bare bones at that point (and can potentially sound like crap too!) but sometimes it can be a very laid back and playful moment between the band members, when there is no pressure to perform to anyone and they have a chance to try new things out, rehearse or experiment. In a way it’s quite a private affair – and so to get a glimpse into that informal and personal moment, I thought, could be quite a unique opportunity and people might enjoy watching it. I don’t have a schedule for filming or approaching bands, hence the reason that there haven’t been so many ‘episodes’ as of yet. If I come across a band I enjoy, bumping into a band member or seeing a show that’s coming up nearby, I will approach them and ask. But because it’s quite a private thing, I’ve tended only to film the bands that I have some personal connection to i.e. one or more of the musicians knows me, so are comfortable with me walking around with a camera as they set up and soundcheck – in this case, I had worked with Hauschka before, documenting the making of the music video for Radar. Generally there are only 4-5 takes, long and uninterrupted. So far I’ve only shot with a fixed 50mm lens on a Canon 7D (which is by no means a ‘rule’) which can give you an extremely shallow depth of field when opened up to f1.8 and therefore some very nice bokeh and lens flares. The result is a very intimate close-up view of the musicians’ hands, guitar strings, keys, etc. drowning in the bright out-of-focus field of the lights or colour. I’ll usually just walk around if there’s space, trying to get as close as I can to the subject, rolling for as long as I can hold a fairly steady shot or as long as there is something happening on screen. In post, it’s just a case of choosing 3-4 of these long takes and cutting them together, with some minor colour correction to bring out those lovely saturated colours. Since soundcheck is often quite a short process, I’ll only manage to film for 10-15 minutes anyway. Hopefully by that point I’d have 3-4 takes good enough for a film.